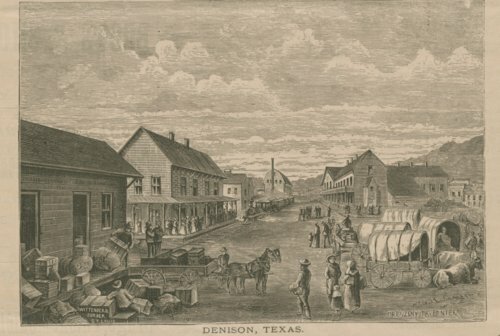 This is an illustration showing the depot and train in Denison, Texas. Also visible are covered wagons and oxen, business buildings, and a horse-drawn delivery wagon. The illustration appears in The Great South-West, August 1874. It is credited to both Paul Frenzeny and Jules Tavernier.